An immaculately presented FORMER SHOW HOME of just over a year old and located close to Storrington village. Constructed by Crest Nicholson builders to a high specification. Accommodation comprises: entrance hall, ground floor cloakroom, superb KITCHEN/DINING ROOM with integrated appliances, sitting room with uPVC double doors leading to SOUTH ASPECT GARDENS and terrace. 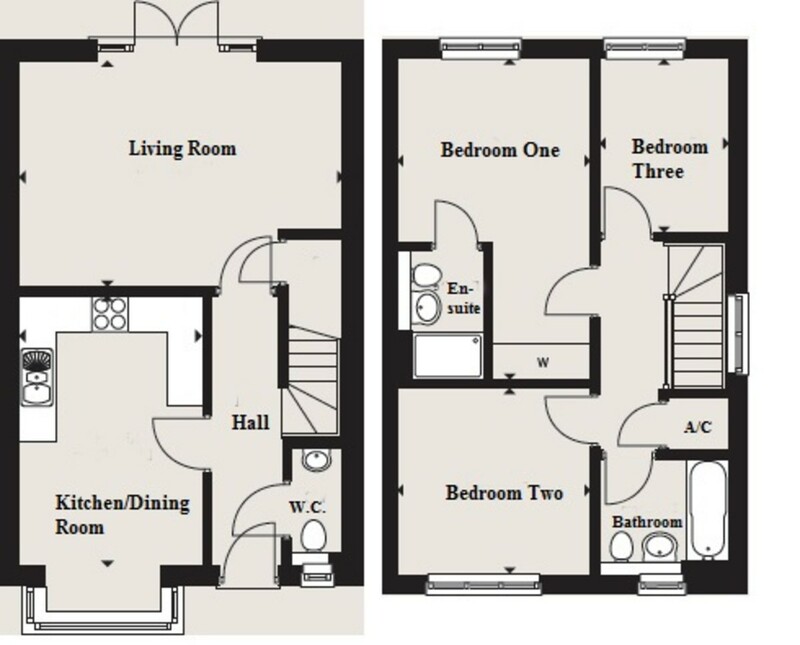 Upstairs there are three bedrooms, with en-suite to the master bedroom and built-in wardrobe cupboards, main family bathroom. Outside there are beautifully landscaped gardens to the front with south aspect to the rear with a large paved terraced area. ENTRANCE HALL Laminate exposed wood style flooring, radiator, concealed spot lighting. GROUND FLOOR CLOAKROOM Low level push flow w.c., part tiled walls, wall-mounted wash hand basin, double glazed window, extractor fan. KITCHEN/DINING ROOM 18' 2" x 10' 3" (5.54m x 3.12m) Extensive range of wall and base units with integrated appliances comprising: 'Bosch' fan assisted oven and grill, 'Bosch' fridge/freezer, 'Bosch' dishwasher, 'Bosch' washing machine, inset four ring gas hob with extractor over, range of working surfaces with inset one and a half bowl single drainer sink unit, concealed spot lighting, extractor, double glazed window bay, radiator, eye-level cupboards with downlighting. SITTING ROOM 17' 11" x 12' 4" (5.46m x 3.76m) Two radiators, built-in understairs storage cupboard with double glazed windows and French doors leading to terraced area and garden, TV point, telephone point. FIRST FLOOR LANDING Access to loft space, shelved linen cupboard housing 'Potterton' combination boiler. EN-SUITE SHOWER ROOM Fully enclosed shower cubicle with sliding Perspex and chrome screen, mainly tiled, wall-mounted wash hand basin, low level flush w.c., shaver point, mirror, extractor fan, concealed spot lighting. BEDROOM TWO 10' 5" x 10' 1" (3.18m x 3.07m) Radiator, uPVC double glazed windows. BEDROOM THREE 9' 3" x 7' 0" (2.82m x 2.13m) Radiator, uPVC double glazed windows. FAMILY BATHROOM Panelled bath with fitted independent chrome shower unit with folding Perspex and chrome screen, low level push flow w.c., wall-mounted wash hand basin, mainly tiled, extractor fan, concealed spot lighting, double glazed window. ATTACHED GARAGE 18' 0" x 9' 3" (5.49m x 2.82m) Up and over door. REAR GARDEN South facing garden, large paved terraced area, lawned area with attractive flowers and shrubs, enclosed by fence panelling, outside sun awning climbing over the terraced area, outside lighting, door accessing garage.